Effective 15th December 2015 terms and conditions for membership upgrade will be updated. Upgrade options will be more transparent and fair for everyone. Please let me walk you through the most important changes. After purchasing one of our single products you will have 30 days during which you will have an option to either ask for refund for the product or upgrade to one of our membership packages for only the difference of the full membership price and what you’ve already paid. If you purchased more than one product, the highest price will be discounted. Adding up prices for several products is not possible. What happens if I don’t opt for any of these options in 30 days? You can enjoy your product, support and updates for 1 year since the initial purchase date. If you decide to upgrade to a membership after those 30 days you will be charged the full price. If you buy a business membership you can upgrade to premium for the difference of the prices within 30 days of initial purchase. Please note that membership prices are non refundable. I already bought AIT product some time ago, how does this change affect me? New T&C apply to all our customers. This means that you have 30 days since the purchase date to upgrade to a membership for better price. If you bought your product more than 30 days ago, you only have time till 15. December 2015 to upgrade under the old Terms and Conditions. What is my costs when I decide to upgrade to Premium membership? Let say you purchase single product because you would like to see if our themes, plugins and framework meet your requirements but later some other products may be suitable for you as well. You can upgrade for a difference in price between higher package and your most expensive product already bought within last 30 days. Validity of your membership package will be 1 year from the day of upgrade. Please see below how the price is calculated. 1. In last 30 days I bought 1 single product (theme or plugin) for the price $55. I have a Premium Membership now and it end soon. What shall i pay if i take a new Premium Membership now. Thanks for your message. You will always pay the same price as you already paid the first year. Feel free to renew your membership now. Thanks for your message. Yes you can upgrade for a price difference between City Guide theme and Premium Membership. You can only do that up till 15th of December. After that date new terms&conditions apply. Sorry, I am right that I purchased a single product from you and now you are telling me that I must now pay more money to upgrade to a plan I don’t need or want? Thanks for your message. No you don’t need to upgrade to Business or Premium membership. It’s up to you if you wish to upgrade or not. What’s changing that from 15th of December you’ll have only 30 days to decide if you wish to get advantage of discounted upgrade price. After that you’ll need to pay a full price if you wish to upgrade to a higher membership. I have renew my membership today but i was to quick. thanks for contacting us back. We are just solving your issue. It looks like you have used some link that leeds to upgrade to a Premium membership /not to renew. It’s our mistake, therefore please wait a little bit, we will come beck with the solution as soon as possible. I have a question: I bought your City Guide theme as a single item and the Get Directions plugin a half year ago. I like to have updates and support for more than one year (say lifetime). 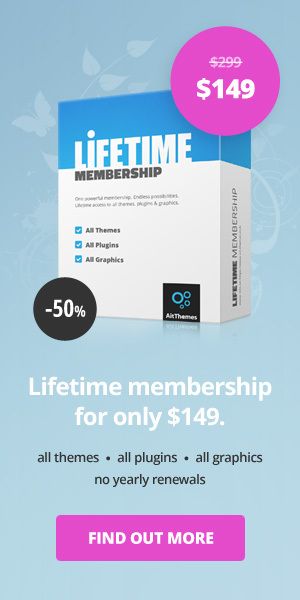 Do I have these, after buying a single theme and plugin or do I need to renew this after one year? thanks for coming back. Each of subscriptions we offer lasts 1 year. Before ends this period you can at any time renew your membership or product for another 1 year for the same price. You can do it at anytime. What should i mention is that we are going to change a little bit upgrade policy from 15 of December – in your case it concerns only that: after mentioned date you will not be able upgrade to Premium /if you would be interesting/ BY PAYING the DIFFERENCE between the prices/packages. You can get Premium only for a full price. That’s all. Добрый день! Скажите пожалуйста, если после года использования премиум членства, я не захочу его продлевать, то темы и плагины которые я настроил работать не будут? Или они будут работать, только без обновлений? thanks for asking. 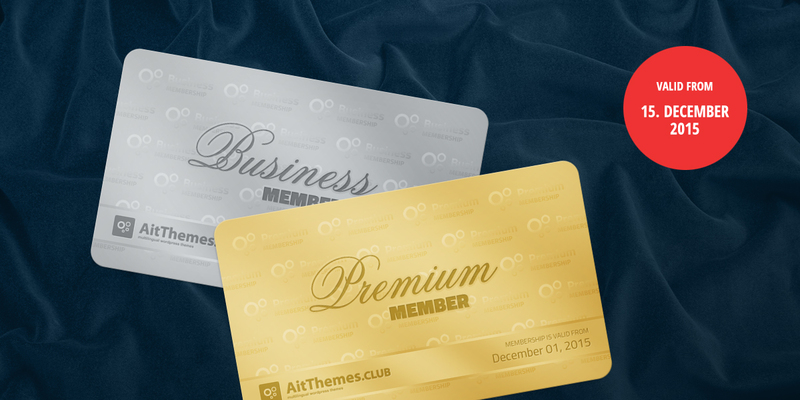 After 1 year you can still use themes and plugins from http://www.ait-themes.club. When you renew your membership you will get access to new updates, access to our premium support forum and also you will get all new products that we are going to release for the market through ait-theems.club. You can even renew for the same price at any time – no problem. How many sites can I create with single license? each product you get on http://www.ait-themes.CLUB comes with unlimited license usage – any theme, plugin can be used for unlimited domains, web projects, etc. Where is the customer service link for members? I have purchased the Premium Membership and only have access to the Business Membership. Also, I have sent a question to Support 4 days ago and still have not received an answer. What’s up? thanks for your message. Purchase code is an unique pass code that is sent within a product purchased at http://www.ait-themes.club which is the result between the seller and buyer. We do not take responsibility for incorrect handling from customer side, anyhow could you please provide us of PC in order to check it and have a look closer. Hi, So i upgraded because it said I would receive a refund for the products ordered individually, but now this blog post is saying I will only receive a refund for the top priced product? I have spent $150 on products, but I presume you won’t include the theme cost in that as it was bought from ThemeForest and you will only refund me $45 for the top priced plugin? Can you confirm you will also be refunding the VAT as this product in essence has not been sold. Also, I paid $420 for the premium membership, I was logged in and no discount was applied. Please help because up until now this was a good experience but now I feel cheated. thanks for your message. Could you please provide us of your user name or email that you used for registration in our system at: https://system.ait-themes.club ? It allows us to trace your account and check your request. Thanks a lot in advanced.